The cerebrum is the largest part of the brain that constitutes the forebrain. It is the part of the brain that is responsible for all the voluntary actions of the body. It is located on top of the brainstem and is considered the most developed part of the brain. The cerebrum is the newest structure in the brain, phylogenetically speaking. This part of the brain is most-developed in mammals among all other species. The cerebrum, in humans, surrounds all the other parts of the brain. The process of human interaction, speech and learning works in humans through the complex processes that occur in these areas. The olfactory, limbic and motor systems send fibres from the cerebrum to the spinal cord and brainstem; the volitive and cognitive systems, in turn, sends fibres from the cerebrum to the thalamus to other regions of the brain. The cerebrum is actually responsible for all the complex behaviours in human beings. 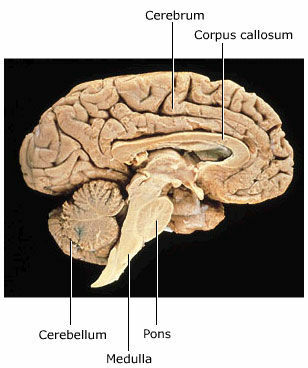 The cerebrum is primarily responsible for the volitional motor functions of the body. These movements come from the primary motor cortex and the frontal lobe motor area of the brain, where these functions are planned. The upper motor neurons of the primary motor cortex transmit axons to the brain stem and the spinal cord which, in turn, synapses with the lower motor neurons. The cerebrum is also responsible for sensory processing. The cerebral cortex in the cerebrum is responsible for receiving and processing sensory information such as visual, gustatory, olfactory, and somatosensory. Through the cerebral cortex, a person is able to notice and appreciate the things around him by using his senses. A person’s ability to speak and to learn languages are due to the functions of the cerebral cortex. Language is attributed to the Broca’s area, which is located in the frontal lobe; whereas speech is attributed to the Wernicke’s area, located at the temporal lobe. Speech is a primary function of the left hemisphere, though there is a little bit of speech attributed to the right hemisphere as well. In cases where damage in the left hemisphere is experienced in childhood, the right hemisphere would take over and will become primarily responsible for your ability to speak. A person’s learning and memory is also attributed to the functions of the cerebrum. Memory formations happen in the hippocampus, which is located in the medial temporal lobe. The functions of the cerebrum are what makes humans function; without it, you would not be able to communicate through speech or perceive languages, you would not be able to move your body and you will not be able to improve yourself by learning more things. Any damages to the cerebrum or any of its sub-regions can significantly affect the way people function. It can lead to paralysis, impair your ability to speak and can lead to other serious brain conditions that will impede the normal functioning of the brain.